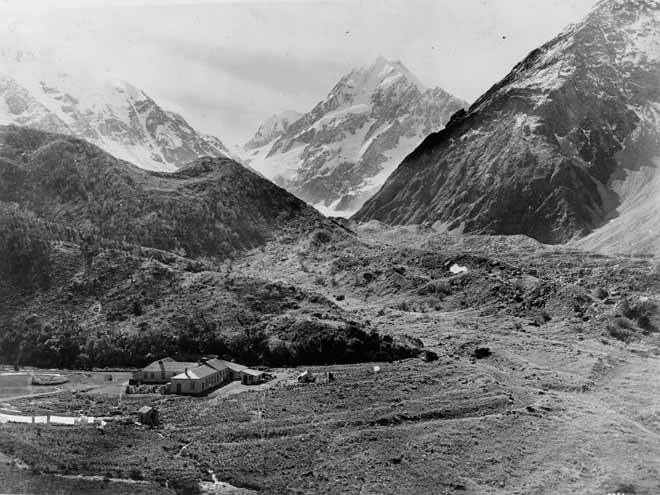 The first tourist hotel at Aoraki/Mt Cook was called the Hermitage – as were all subsequent hotels there. The first was built at the base of White Horse Hill by surveyor Frank Huddleston in 1884. It was used as a base for climbing and was bought by the government in 1895. It only had 35 rooms. This image was probably taken in the early 1900s. In 1914 the government built a new Hermitage hotel (with 50 rooms) on a more elevated site with better views of the mountains.